If you need a good steamed broccoli recipe, look no further, because this is the best broccoli seasoning ever! I must admit, I am not a huge vegetable person. I had hoped that my taste buds would mature as I became an adult, but the sad truth is… veggies just aren’t my faves. Salads are delicious to me, but that’s about it. 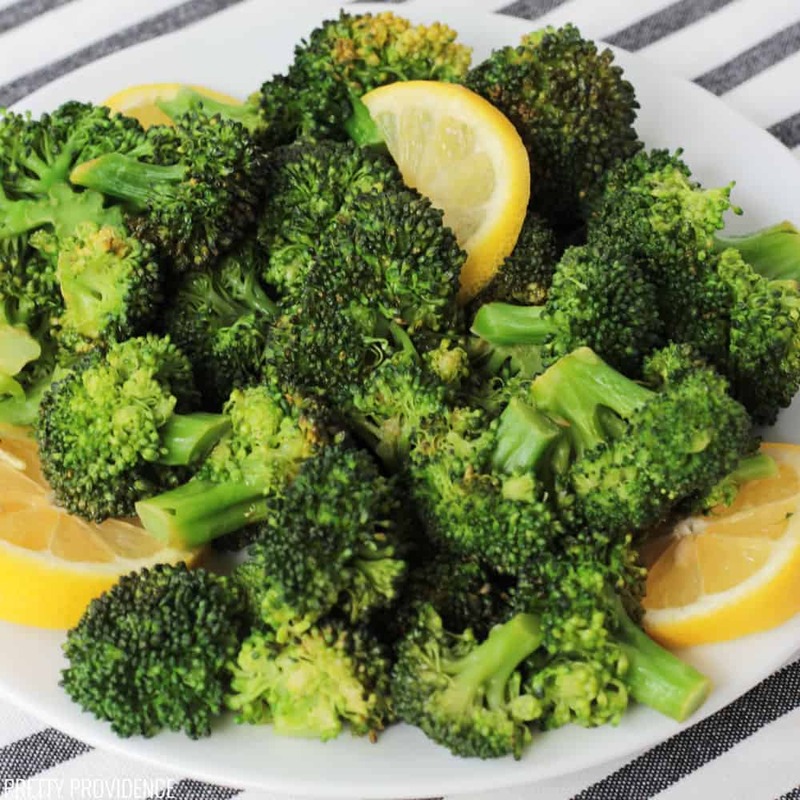 Until, of course, I was introduced to this steamed broccoli recipe! Oh. My. Goodness. It is seriously good. Guess what the best part is… it is steamed in the microwave! Did you guys know you could do that? Have I been the only one missing out? One of the reasons I don’t love veggies is because I typically don’t like frozen or canned veggies and I thought that fresh ones took too long. This discovery has opened up a whole new world of scrumptious vegetable options to me… and this broccoli seasoning… to DIE for. My husband made it up, and I made him make it three nights in a row. Then, I made him teach me. 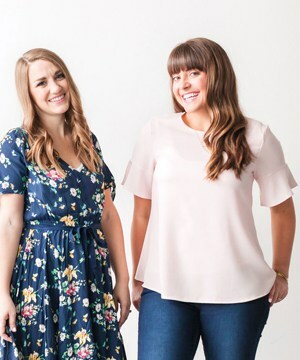 Once we knew it was solid, I measured everything out so that I could share it with all of you! 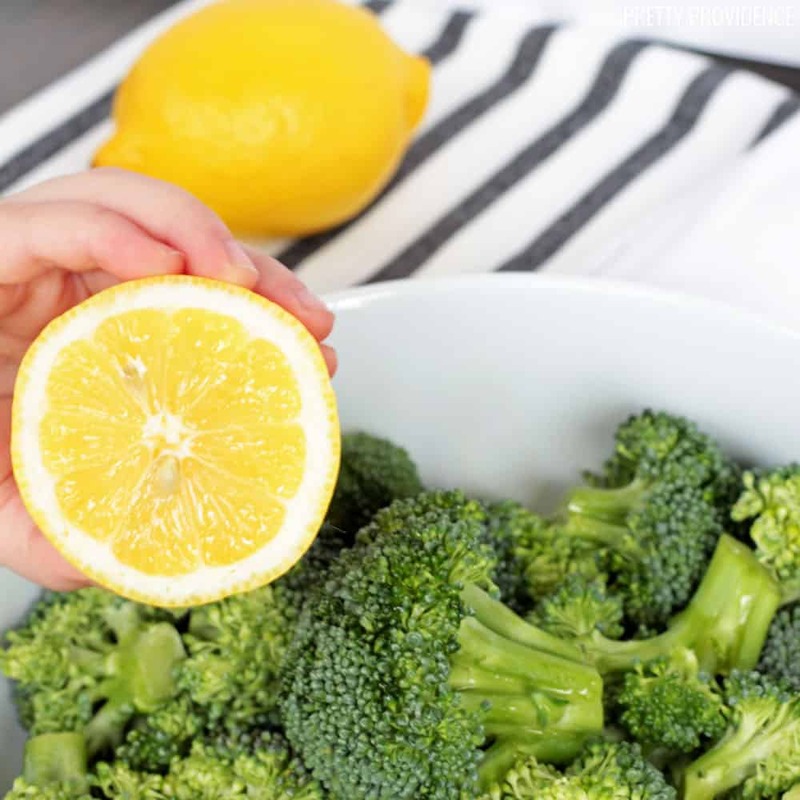 Place broccoli in a shallow bowl and add thyme, garlic salt, lemon juice, olive oil and toss. Add water. Cover the bowl with plastic wrap and steam it in the microwave for 4 minutes. Let it sit for another 3 minutes before removing from the microwave. Yes, it really is THAT easy. I should also mention, my kids LOVE this recipe too! They are picky with a capital P, but no one complains about this broccoli seasoning! 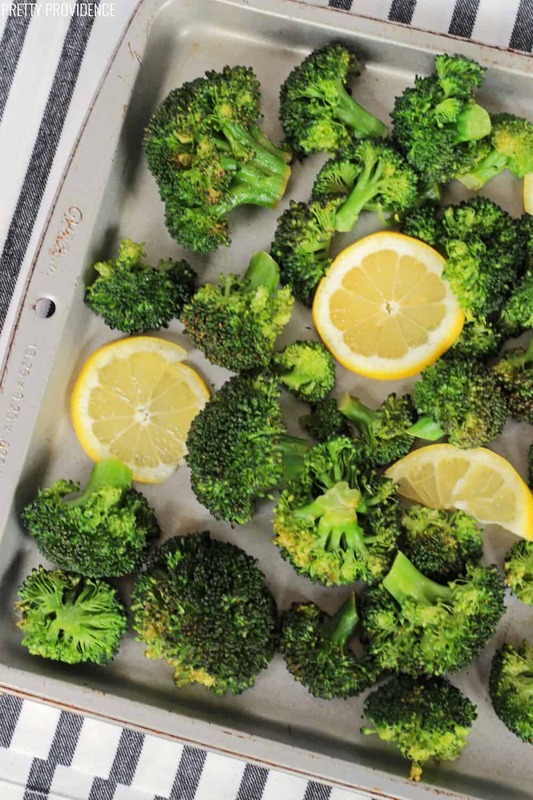 Now, are you someone who prefers your broccoli roasted? This seasoning is great for that, too! 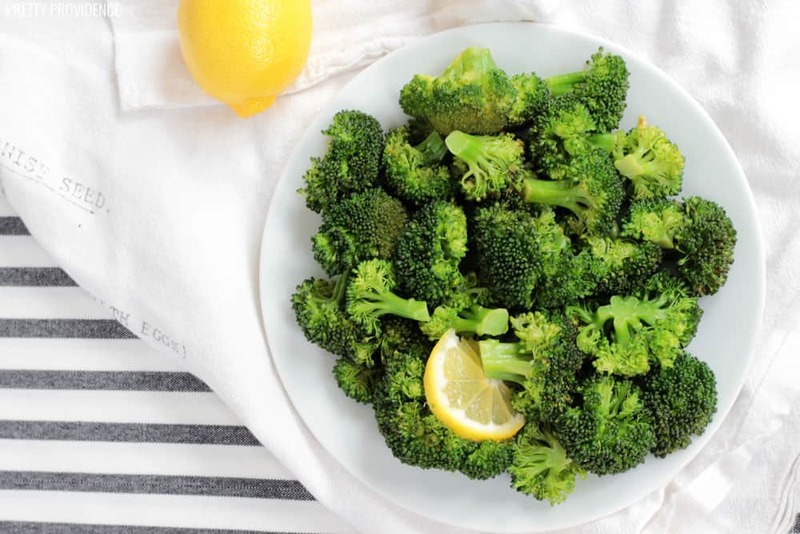 Toss broccoli with thyme, garlic salt, olive oil and lemon juice. Put broccoli on a lightly greased cookie sheet. Lemon slices are optional, but they do make it look so pretty and add another dimension of lemon flavor! Roast broccoli at 400 degrees Fahrenheit for 20 minutes. Notes: I prefer my broccoli to still have a slight crunch to it. You can roast it for longer if you like it to be softer or slightly charred. Man.. I am salivating just typing this… and for a vegetable, that’s really saying something! 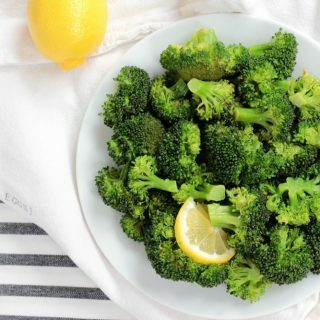 If you think you don't like broccoli, wait until you give this delicious broccoli seasoning a try! Best part is, it's still healthy! Put your broccoli and your water in a microwave safe bowl and cover loosely with plastic wrap. Microwave for 3-7 minutes. When your broccoli is cooked according to your preferences, remove it from microwave and drain excess water, if any. Add all your seasonings and toss to coat. If you like your broccoli to still have some crunch to it, cook it for less time. I recommend steaming 3 to 4 minutes in the microwave, or 15-20 minutes roasting in the oven. If you like your broccoli to be soft, steam it for a full 7 minutes in the microwave, or roast for 20-25 minutes in the oven. We love to serve broccoli with this easy Chicken Schnitzel or our Chicken and Stuffing Bake! This recipe was originally posted on March 28, 2013 and has been updated. LOVE this seasoning for all our roasted veggies!! Broccoli is one of the only veggies I can get my hubby to eat. LOL! This seasoning is perfection! Same with my kids! Haha. So glad you loved it, thanks Stacie! 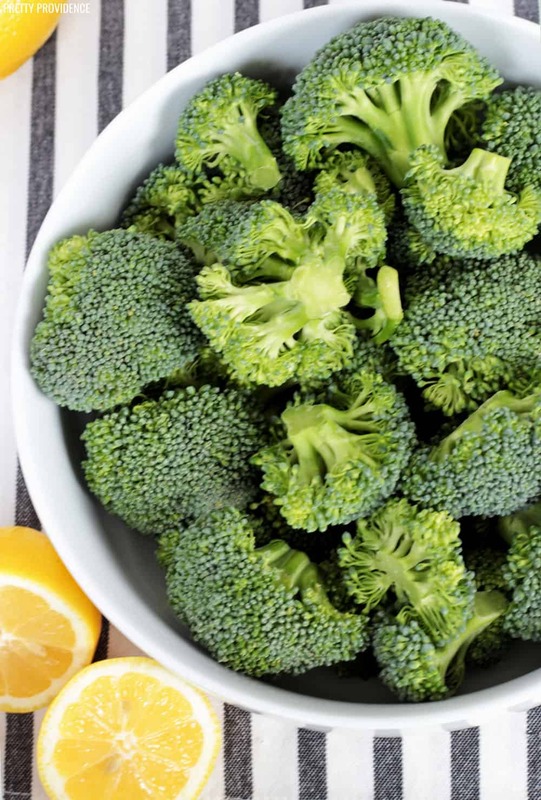 Broccoli is one of my favorites – and this seasoning is the BEST! Yay! So glad you love it!!! Thanks Courtney! Love me some broccoli, so I’m definitely going to try the seasoning! Sounds super tasty! OMG, I literally just made “The Best Broccoli Seasoning Ever” and my family loved it, I mean loooovvvveeeed it. Thank you so much for this awesome recipe! I’m not a big veggie fan myself but I’m gonna give this a try is sounds pretty good, you might have a winner here???? Yay! I really hope you love it!!! My daughter didn’t want the usual seasoning I put on steamed broccoli so I gave this one a try tonight. It was nice and I will put this in the rotation to make again. Yay! I’m so glad you liked it! Thanks so much for coming back to comment! I just tried it – PERFECT! Thanks for this great idea! I love this easy method–and if you’re really feeling lazy, when you’re steaming just replace the water with a favorite salad dressing. Comes out of the microwave ready to eat! I’m so going to try that!! I love broccoli! This sounds like a perfect way to top it. I love Broccoli and I have always made it in the microwave, but my microwave is broken (has been for about 6 months) and I miss my Broccoli! Too lazy to do it another way… but maybe I will just so I can try this seasoning. Haha you totally should! It is delish!! If you are missing your broccoli you can do the same effect on the stove, it a pan poor alittle water in it add the broccoli, cover and watch it steam! Both ways are pretty easy and taste the same!